I wonder if the future you took a glance of is right here? – I’ve wrote down the lyrics from a romajization, so they’re not 100% official. It’s not a ear-copy, though. The lyrics are correct, but kanjis / readings / kanas are not to take for granted. There could be some kanjis I’ve wrote in a way instead of another (I mean, kirakira readings songs like this ALWAYS have), but the meaning of the song is clear enough, so I’m positive my transcription is roughly 100% accurate. Fixed some kanjis, no special readings, everything was correct anyways, just some slight kana / kanji differences. Thanks to Violet for sending me the scans from the album for comparison! – The sevent stanza is full of names in katakana. The one I think deserves to be pointed out is アンデスノオトメ “Andes-no-Otome”, the japanese name for the Cassia fistula, known as the “golden rain tree”. I have done some research about the possible symbolic meanings of “amethyst” and “golden rain tree”, but I haven’t found much / nothing that seems to fit with the songs’ content. Spit without any solace…you will never see! That calm has walked away…my circles were shattered!! – These lyrics are from CLOCKWORKS TRACER’s official soundcloud account. There’s “innecent” in the second stanza, but I think that’s a typo. I fixed it in the transcription / translation, but not on the kanji section. – Second stanza: when refered to a flower, the world “kuruizaku” (狂い咲く) means the process of a flower blooming out of season. I couldn’t find other world to express the concept of “an impulse that has come out here and now, which is not the moment it should have come out”. Yeah. I just kept “off season” hoping it won’t sound weird. – Fourth stanza: “umaru nado nai” (埋まるなどない) should literally be “something that has not been buried or such”. I didn’t like my attempt to keep this form, so I decided to choose “unburied, intact” which I find fitting and nice-sounding. – Last stanza: I don’t even want to know how “―宿命められた” is read as “sadamerareta”. I’ll just accept it the way it is. I give up. 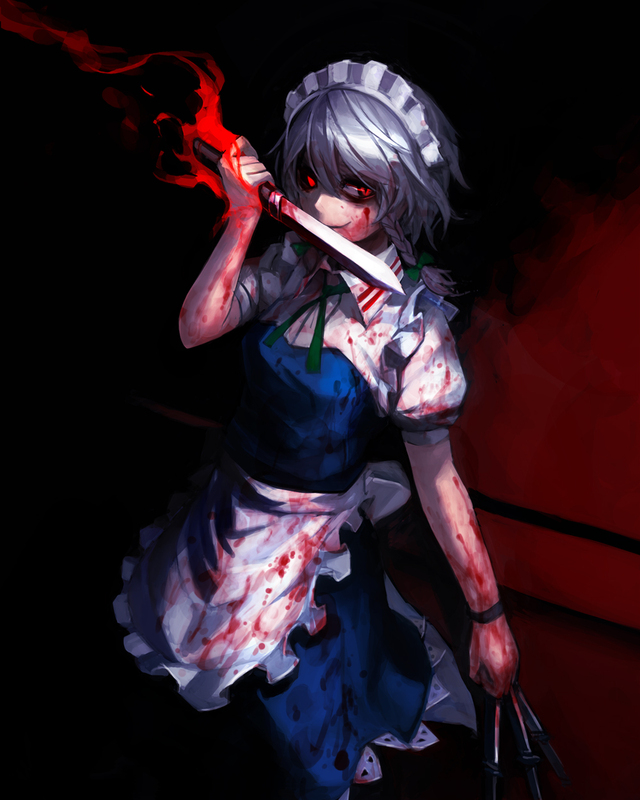 You should know by now, give me an arrange of The Maid and the Pocket Watch of Blood and I’m sold. 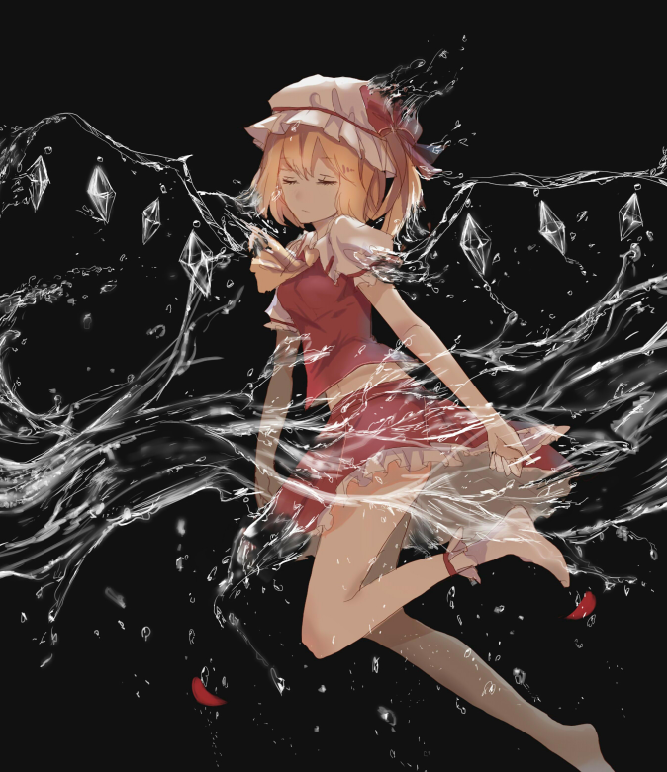 I like this song, it’s the typical random japanese doujin arrange that I love listening to once in a while. And yet it works so well! The lyrics are really simple, but, again, simple doesn’t mean it’s not good enough. I think that simpler is better, after all isn’t it supposed to be like this? watashi no mayoi ya tsumi wa itsuka yurusareru? Will you eventually forgive my sins and hesitations? – I’ve transcripted the lyrics from a youtube video which featured its lyrics, so I have no idea if the stanza order is right or not. The lyrics are 100% correct, though. In the video, when the singer says “進まない時” (susumanai toki), the lyrics are wrote as “進まない夜” (susumanai yoru), while she still says “toki”. There could be two reason for this. The first is that “yoru” is a mispell, probably because in the first stanza there’s a similar sentence with the same verb 告げる (tsugeru) in which the subject is “yoru”. The second is that, on the original booklet, “yoru” appears clearly, but it’s read as “toki”, like japanese guys always love to do. A kira-kira reading, in other words. I don’t know because I don’t have a booklet, so I wrote “toki” instead of “yoru” thinking of it as a mispell. This isn’t quite the song that pops on one’s mind when you feel like entering a library, isn’t it? 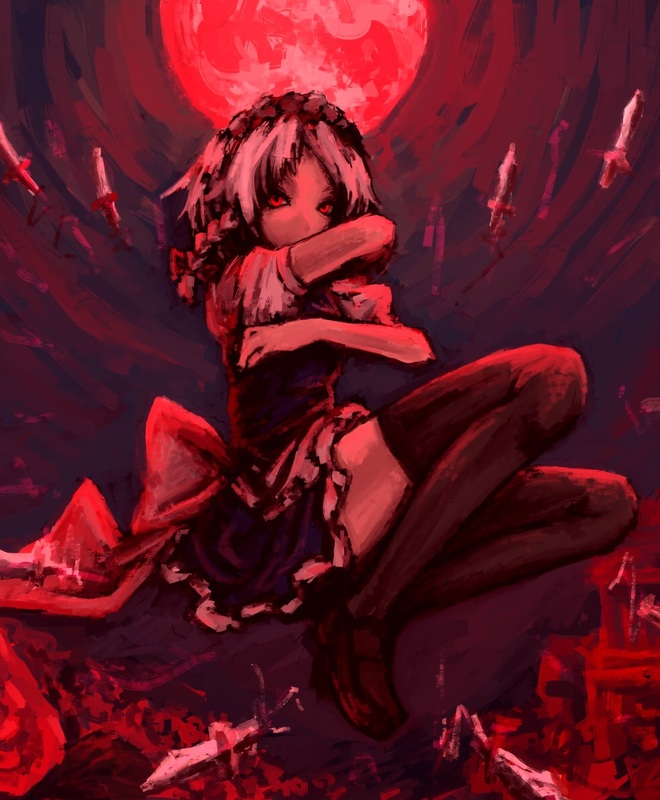 But we’re talking about Touhou here, and libraries are not safe places at all. Books firing lasers, demons silently pursuing your movements, anemic spellcasters casting their magic on whoever passes through… Yeah, definitely not the place where I’d like to read a book in. 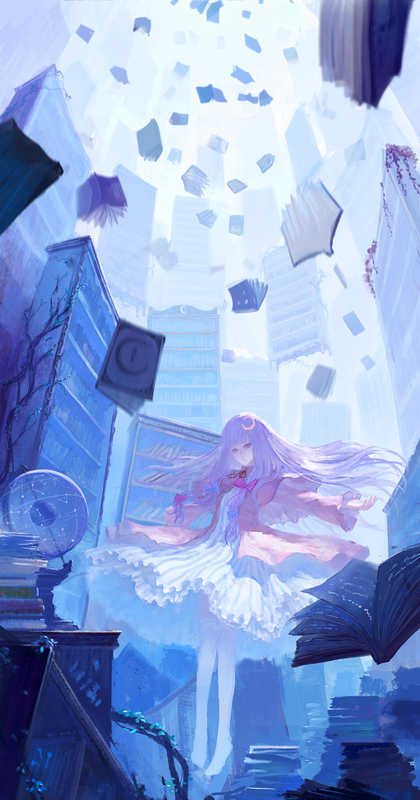 And, believe it or not, this song fits really well with Voile, the magic Library. 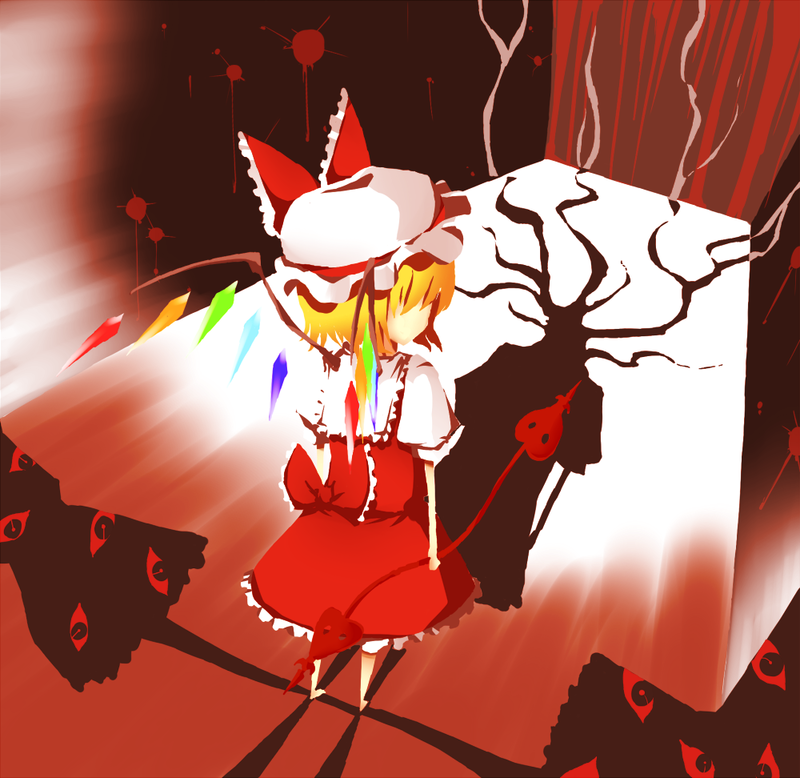 Which of course is in Gensokyo, where nothing is logical. Or probably is more logical than anywhere else. The point of view of this song is unclear. Is it from Patchouli? Or from someone lost in the library? Or both? Still, I find pretty interesting the fact this song’s real “protagonist” is the library itself. …Or is it? Maybe this Library is just… a librarian? Mh, maybe. After all… Libraries can’t take a walk or surf the internet… I think. meizu no you na ookina toshokan deshou? It’s a library as big as a maze, don’t you think? Just for how long does it keep on going? So, devote your whole self to me! – ロマン砲 (roman hou), second to last stanza. Mh… “roman” could be both “romantic” or “roman”, but I can’t tell. “hou” is cannon or artillery, but I can’t figure out what’s its meaning. Probably some quote I didn’t get. Don’t trust my translation of this word, I couldn’t figure it out as much as I wish I could. – Very last stanza, last sentence. There’s no verb, but it’s a common japanese structure to avoid saying an obvious verb. So, I’ve added it anyways in the translation. 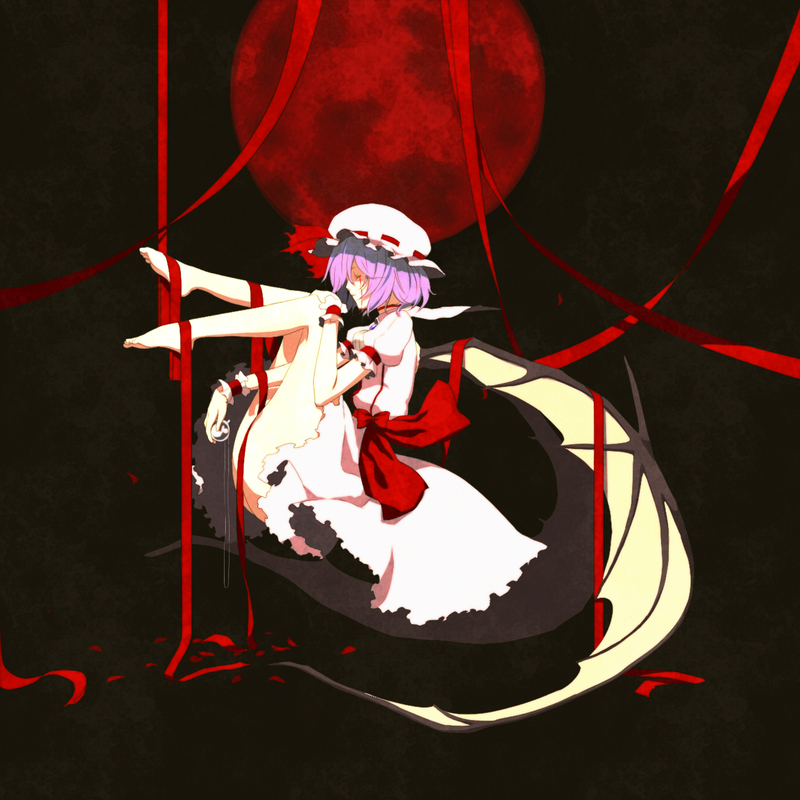 Septette for a Dead Princess is probably the most arranged theme ever. Or at least one of the top 10 most arranged. This is not even the first post which is an arrange of it, but I don’t care as long as it sounds good. This song was really easy to transcribe, but not to translate. I’ve studied some classical japanese, and this song is full of it. While I don’t claim to be an expert of heian-period japanese grammar, I’m pretty sure I didn’t f*ck everything up. 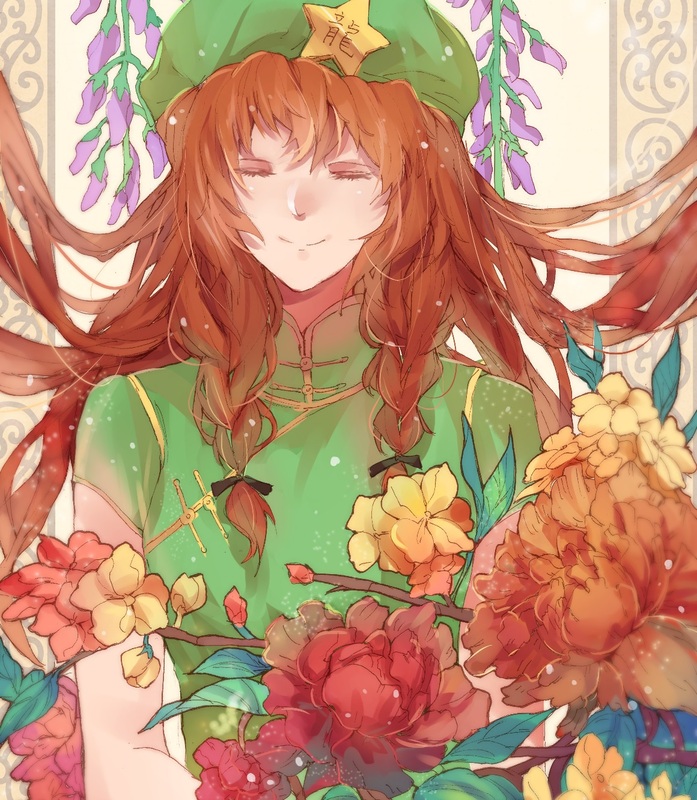 Bury the Earth’s ground, oh widely blooming flower! And I… I’ll keep living, I’ll keep on living forever. – I don’t like how I translated the first stanza, but couldn’t find a better way. The song says “yume” two times on the same line, so I tried my best not to write “dream” twice. Hope it doesn’t sound strange to you as it sounds to me. – Hope I didn’t f*ck up the use of “arcaic” english sometimes. I tried to convey the old verb forms in japanese into english. I’ve probably failed. Let me know if anything’s wrong. – There’s nothing that can confirm who’s the subject of the second stanza. Could be both “you” or “me”. I used “me”, but they’re both possibilities. So you may think that Sally should be one of my favourite circles by now… But it’s not. Let’s start saying that I discovered that circle right from the beginning, I randomly gave it a listen when their first album came out and was actually really impressed by it. Then I’ve listened to other albums and noticed that good tracks were becoming more and more repetitive and, at least to my ears, worse. That doesn’t mean I don’t like each and every song from this circle. There’s at least a song I like from each albums they made. It’s just that… Each album is like the replica of the original album, they copied its style and its structure. Because I think con~痕~ (you can already see its title has the same structure as min~眠~’s… But it’s nothing like it) is the best track from Syndrome album. But still, it’s nothing exceptional, in my opinion. Still, it kinda surprised me no one has ever translated it in english (NOTE: Because it makes no f*cking sense whatsoever). 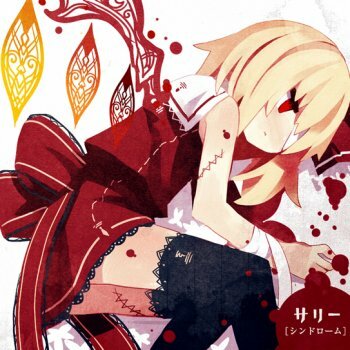 After all, either in a good or a bad way, Sally was something that was part of my touhou-arrange musical experience. Let’s just say this post is a tribute to min~眠~. This all for you is wave or gun. This all for you is wave and gun. – Don’t mind the engrish, please. It’s part of its lyrics. – 鼓動 on the second stanza is, as always, “beating”, “heartbeat”. But here doesn’t make much sense, so I simply translated it as “sound”. – 空 (sora) in the 6th stanza, is “sky”, but it could also mean “emptiness”, “void”. “Sky” didn’t make any sense, to me, so I used “void” instead.